Transit planning is frustrating in such a place, but road planning is even more so. Ultimately, Seattle’s chokepoints have the effect of reducing much of the complex problem of mode share to a critical decision about a strategic spot. If you give transit an advantage through a chokepoint, you’ve given it a big advantage over a large area. None of this is inconsistent with having a grid. If transit is given priority at critical chokepoints (crossing Lake Washington or the Ship Canal, say) then transit suddenly has a major advantage throughout the city. This advantage increases the more grid-like the system is, since you can increase the area of the city that’s a single transfer away from using transit across the chokepoint. As I said in the last post, Metro does a fantastic job of providing one-seat rides to downtown during rush hour, but it can (and should) push to provide better all-day access in places where land use patterns warrant it. Given the looming budget crisis and limited resources, exchanging one-seat rides for all-day mobility via transfers should definitely be on the table. *Another great Walker post, on the Portland grid’s 30th anniversary, discusses the political challenges of moving from a radial network to a grid. Walker wisely gives lots of praise to Mr. Matoff for transforming Portland to the grid, then went on to plan and build a very successful light rail system that is still growing today. Tom was later convinced that Seattle needed his talents more than Sacramento did, to jump start our own LRT as Director. Unfortunately, we let a transit ‘all star’ slip through our fingers as the politicians thought they were transit experts and big spenders to boot. Oh well, Seattle lets lots of talent go elsewhere – just ask the Mariners on some of their trades. Not to be ignored, in many cases, a gridded system doesn’t even necessarily mean transfers, even if you are making a trip that, on paper, should require one. Often, transfers can be avoided by walking, biking, or driving (*) the shorter segment of the trip and, even then, you still benefit from the higher frequency the gridded system enables for the longer segment of the trip. (*) This has become considerably easier and cheaper with the advent of Car2Go, but even before Car2Go, I have used taxis for this purpose in the past. Since you brought up paper transfers, is there any chance they will ever go away? Now with RapidRide rear entry, there’s always a need for them. Getting rid of transfer slips will just make it harder for Metro to take away one-seat rides. That’s the opposite of what we want. Having said that, I do wish that the ORCA implementation had been more like the MBTA’s Charlie system. In addition to the CharlieCard smart cards, they also have CharlieTickets, which are like paper transfers but are automatically printed out and recognized by an on-board reader. Of course, using a CharlieTicket takes longer than using a CharlieCard, and so it costs more. As it should. But there’s no further penalty for having a trip which uses 2 (or 3, or …) vehicles instead of 1. RapidRide needs a piece of paper that suffices for proof of payment. It doesn’t have to be a transfer slip. At least on RapidRide, getting past the operator with a transfer that expired months ago does not create a defense of “Well, he didn’t tell me to get off the bus” when the fare inspectors catch the non-payer. It’s nice that the driver doesn’t have to spend several minutes arguing with belligerent individuals demanding a free ride. It’s not so nice that we don’t have a system to simply give free rides to those who cannot afford to pay and charge those who can, but that’s a topic for another post. Don’t forget the folks who had books of old transfers to avoid paying at all after enough rides. This is why analog paper transfers with diagonal tears just don’t cut it for proof-of-payment systems. 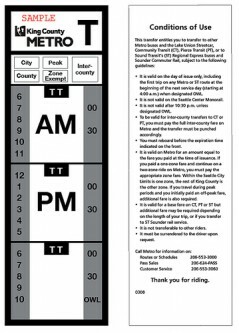 Without an actual printed or written time on a ticket, the tear, which is set at the beginning of the run, and not very precisely, creates a wide time range within which the rider might have boarded and received the transfer. Unless it’s been more than four hours, or the transfer is clearly for the wrong day, it is hard to prove that the transfer is expired. The ambiguity of the time on paper transfers creates an incentive to pay with cash. But again, the goal of the fare system should be (1) to maximize fare revenue net of cost to run the fare system, without costing significant ridership; and (2) to stay out of the way of getting the bus from point A to point B expeditiously. If we know that the only people taking advantage of the transfer slip ambiguity are those who really can’t afford to pay, then I don’t mind the ambiguity. But given Metro’s statistic of only 55% of boardings using ORCA, we are a long way from getting cash payment down to those who need to pay with cash. Transfers used to be a more significant part of transit riding in Seattle. I was looking at a Seattle Transit annual report from 1946 (available in the Seattle Public Library) and they listed the number of coaches assigned to various routes. It’s clear that in 1946, transit frequency was much greater so a missed transfer rarely added more than a few minutes to a trip. For example: the 2 West Queen Anne to Madrona Park line operated with 15 coaches during off-peak hours. Today the 2/13 combination route is assigned 6 or 7 coaches during the off-peak. That means that in 1946 the 2 was likely running 8 trips per off-peak hour in each direction. Just missed a bus? Not a worry. Here are some of the other Seattle routes and the number of coaches assigned. The picture is pretty clear. In 1946 most bus riders had a system that forced transfers, but the penalty for a missed connection was rarely more than a few minutes on your journey. In 1946 Seattle Transit didn’t even bother to provide bus shelters at stops! How many boardings per year did Seattle Transit post in 1946? Recall, transit was the norm during the war years, with rationing of gasoline. I wouldn’t be surprised if it were double what today was inside the city limits. Correction: it looks like the current 2/13 combo runs with 9 coaches off peak. The 7/8 network which is roughly equivalent to today’s 7 Rainier + 70 Eastlake + 74 + 73 85th Street used 36 coaches off peak and 61 coaches during the peak. It’s true that gas rationing and the lack of automobile production during WW II created an artificial demand for public transportation, but in 2013 we are seeing that the free market is driving the price of gasoline higher which should lead to more consumers desiring an option to the single occupancy automobile trip. Are we creating the supply to meet the demand? Are we creating the supply to meet the demand? In some situations, no. We need more service on a lot of routes. But in most cases we don’t have the demand to go back to those frequencies from before widespread car ownership. Same argument applies to transfer-dependent system design, then. If most people have cars, you’re not going to get many new riders with a service that has transfers. An infrequent one-seat ride will get more motorists to try it than a moderately frequent two-seat ride will. I heard that routes 7 and 8 on Eastlake each ran every five minutes in the peak hours. Jack: … ? ?, with clunky high floor busses, with one door, narrow isles, cash and tokens only, manual transmissions, bad brakes, no OBA or bus bulbs, or lit shelters, no bus tracking or motorola radios, FTA or PSRC or I-5 or Sonics? You couldn’t be more right about this as the numbers continue to show jobs sprawl away from downtown making an over built hub and spokes that only run during rush hour ever more irrelevant. Meanwhile night and weekend travel to destinations around the Sound continues to be cumbersome using transit. The Mt. Baker Snoqualmie meeting gave me hope, and these are items that should be in the transit agenda…yet the reality is expansion of light rail was curtailed by the time and expense of a few Seattle centric tunnels. The fact is Seattle is neither a star topology nor a grid (much as its compass point street names might hope). It is a rich and complex set of multiple focal points and attractions (think contour map with minima and maxima) which are very much underutilized because adequate transit is not available and the resultant heavy traffic lessens the desire for travel. Stop taking data from other cities and pretending it applies here. Seattle is not depopulating (the opposite in fact), vacancies are so low that there are actually speculative office buildings going up, and unemployment is significantly lower here than in the state as a whole. Note on a scale where 100 is average Seattle gets nearly 100, meaning it sprawls no more nor less than the other cities studied. However look at the individual breakdowns by category. Seattle is far more sprawling than average in all categories but one…street accessibility. A good frequent transfer system is a perfect example of why the SR-520 redesign and Montlake is so maddening. Montlake should have two or three high frequency north-south lines that smoothly interface with east-west lines on the 520 corridor. It should be designed for the transfer. Instead, the east-west buses don’t stop, or have to go through multiple traffic lights and congestion. And the north-south lines don’t have good dedicated transit lanes, and there’s no southbound stop convenient. This is a natural transfer location, and it’s not optimized for transfers at all. Ditto the transfer between bus routes and the Link station at Husky/Hospital – the transfer are terrible.